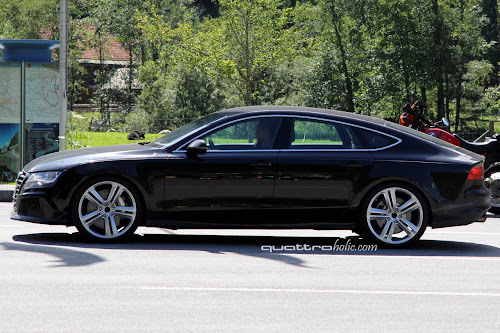 Now that the 2013 Audi S7 has been officially unveiled in Frankfurt, all eyes are focused on the king of Audi's new line of Sportbacks, the RS7. 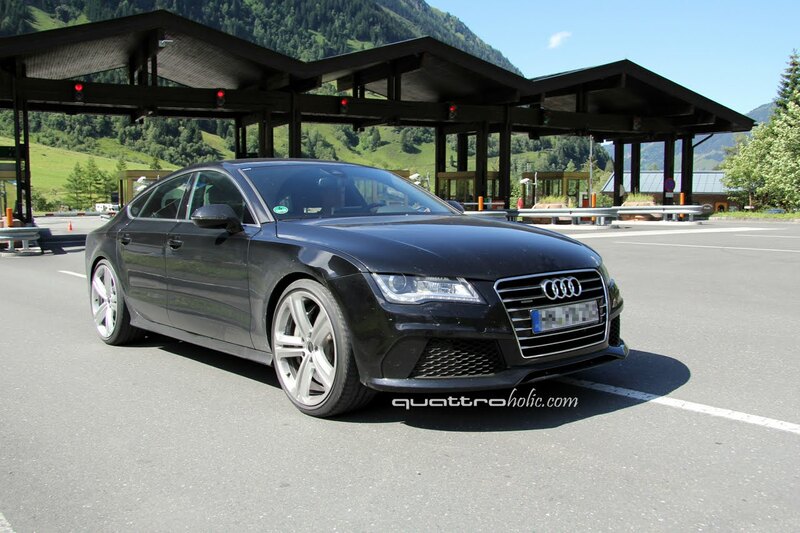 Like the RS4 Avant spy shots we posted in July, this RS7 mule was caught testing at the Großglockner in the Austrian Alps; sporting a nearly production-ready guise, and most certainly packing something very special under the hood. More photos and speculation after the jump. Revealed with two levels of tune, official details of Audi's new twin turbo 4.0-liter V8 offer us a little more to go by concerning power figures for the new RS7. In order to live up to its RS badging, we expect the RS7 will pump out at least the same 520-hp and 479 lb/ft of torque as found in the new S8. Applying that same formula then, we imagine performance will be quite close to the S8 as well, hinting to a 0-100 km/h (62.5 mph) time of roughly 4.2 seconds. Considering the show's level of notoriety, we're guessing the new RS7 will make its world debut at next year's Geneva Motor Show. Most likely carrying a either a 2013 or 2014 model year designation. As always though, until officially released by Audi, this is purely speculation. Either way, there's plenty to look forward to in the coming months.